Question in the title. Just looking for examples and testimonials of people using Steadicams, Ronins, gimbals and the like. I sometimes use a steadystick. It helps me with macro because it moves with me. tri or mono pod would be better but its easy to carry on its belt and i can lean over plants with it. Today i just used it to hold my flash. I have also used it for telephoto on hikes. I have it from old video days so why not use it. Yes, the 'Merlin' from the makers of the SteadiCam, and a Glidecam 4000, both with my K-01. I wasn't happy with the balance of the Merlin, but even at it's worst it was several orders of magnitude better then the software Jello IS of a post K-5 Pentax body. The Glidecam 4000 is really meant for cameras heavier then a K-01 with a 12mm equivalent lens (Sigma 24mm with screw-on 0.5 wide), but returned good results. I would LOVE to see what a K-5 could do on top of a Glidecam. I'll chase some specific examples, of me taking several steps beside racecars as they launched up the road at this years Lake Mountain Sprint, but some shots can be found in the long form of the events video. Basically everything the camera is in motion on a Jib Arm or Glidecam, it's my K-01 or the GoPro I piggy-backed on the hotshoe. So if you're using a steadicam, you have to turn off IS on your camera body? New to this. I shoot with a K5-IIs at the moment. Let the subjects move, keep the camera reasonably motionless. Run'and'gun shooting is still plausible without a rig if you don't trip over... I've seen a number of great clips on YouTube where only IBIS is used. Using a stabilised rig is usually a total replacement for any software based IS - SteadiCam and it's clones were developed for cameras shooting film, before IBIS was even possible. The majority of current stabilisation rigs are meant to be used with the software stabilisation Off. Given the K-5 IIs you use has what was pretty much the best video stabilisation Pentax has ever had - Sensor Shift - you should be able to get similar results to a SteadiCam look, with just a shoulder rig and the Sensor Shift. Adding Sensor Shift to a GlideCam or SteadiCam, your footage should be as smooth as a Gimbal Rig like the Movi or Ronin, just without the massive overspend. ProTip Time : Gimbals,.... HobbyKing website, same tech, but no price gouging. Is there anything I need to do turn Sensor Shift on? 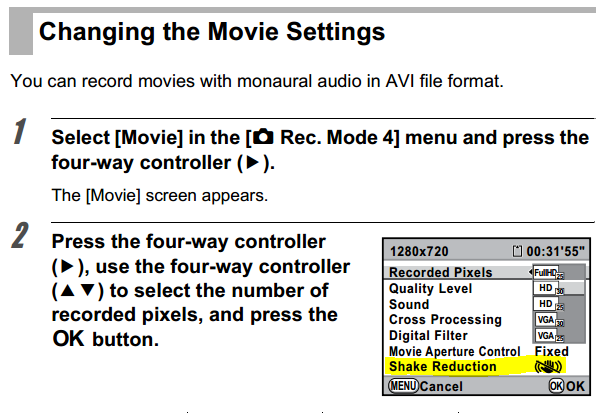 Or do I just make sure Shake Reduction is turned on for video? Because last time I tried recording, everything was just shaky junk, of which I didn't figure out until days later. SR wasn't turned on though. See page 152 of the manual. It's like night and day. Wow. Why would you ever turn it off though? When tripod mounted it's best to disable SR, otherwise you're right - proper IBIS (in-body-image-stabilization) is excellent for hand held video shots. I have the 5-axis IBIS always on with my Olympus OMD EM10MkII for video clips, it's just amazing. EVERY other Pentax after the K-5 series, the Sensor Shift is Only available for photos, with a sub-standard jello-inducing 'software' based SR for Video. That's why we turn it off, software SR destroys video IQ. Now, if you'd care to join the campaign against Software SR and to get SensorShift reactivated, do post samples to Youtube and Vimeo, adding 'Sensor Shift' in the tags, and posting links here. I have added a few more videos with SR on on my YouTube, but since I'm without proper internet you'd have to look for them yourself. Username is kadajawi.